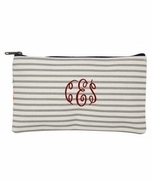 Monogrammed canvas stripe cosmetic bag. Are you going away for a weekend trip for business or pleasure? 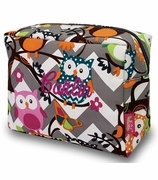 You need a stylish bag to keep your cosmetics separated. This cute canvas bag is the perfect choice. You will love the sophisticated pastel colors that blend from grey to beige, back to grey and are then finished off with a pale blue stripe. The bag opens with a zipper along the top and is perfectly sized to hold all your bottles and tubes and fit snugly into a bigger case, item RS-38842 our matching duffle bag. 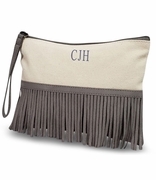 Let us embroider your personal initials onto the bag for a classy finish. 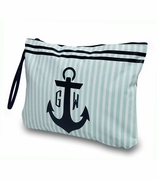 Personalized and embroidered stripe canvas make up bag measures 10"W x 7"H x 3.5" across bottom. Lined with a navy and white designer quatrefoil pattern. Outside piping with zipper closure. These bags were much better quality than I was expecting, and shipped to me very quickly as well! There were a few loose strings that I had to cut off but otherwise were great. 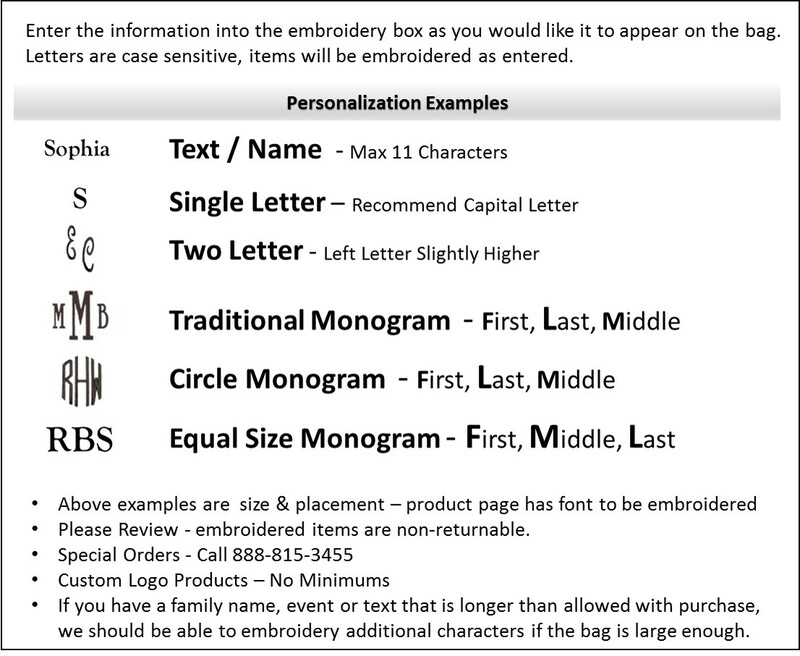 Monograms looked great and the overall size of the bag is perfect. Have already recommended purchases to friends of mine!